Introducing our new and rather special LED light up fairy light winter wonderland baubles £19.95. Gorgeous luxury glass baubles filled with a winter wonderland scene of miniature tree that twinkles with mini LED lights, faux snow, tied with your choice of silky satin ribbon to hang and personalised with your own wording / name. Handmade by Christmas elves from the bauble station in our lovely design studio in Stalybridge, Cheshire, UK. Perfect personalised baubles for baby’s first christmas, family christmas’, bauble for couple. Add a gift box +£5 to house the bauble in and give as a unique gift. We offer them personalised but can do them not personalised too. We’d love for you to say hi & follow us on any of our Facebook, Twitter, Instagram, Pinterest pages. Last week we posted about rainbow invitations but today I die. My obsession of saving colourful clippings finally becomes useful. I hope that this week we can inspire Bride/Grooms planning a colourful rainbow wedding and show how colour can be used when planning a wedding. I’ve found a fair bit of wedding related colour on the web but find that when doing ‘colour’, when it comes to weddings it can be quite tacky. 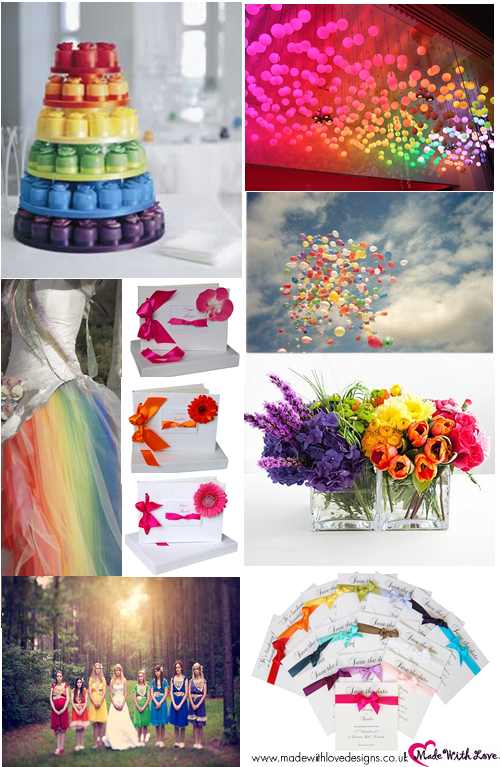 I’ve chosen only to use the coolest and most tasteful rainbow wedding images for each of our rainbow mood boards.